Hello! Welcome to Crew Member Wednesday. Today it's Karin's turn and she made a clean and simple yet eye catching colourful project using Ecoline markers. She is thinking about framing it and I think she definitely should! Today it's my turn to make something for the Crew Member Wednesday and I made something clean & simple and I had fun creating it! I started on a piece of cardboard (30x 40 cm or 11,81 x 15,75 inch) and I used one of Birgits stamps on it. I loved the kind of Mandala shaped patern which emerged. I gave the peacock feathers some color with ecoline markers and that was it. I think I'm going to frame this creation. Hi there! It's Crew Member Wednesday again!! Today Karen is sharing a fun and easy technique that let's you spice up a simple notebook in no time! Wouldn't this make a lovely little gift?!! Hi everyone! It’s time for another Crew Member Wednesday and for this project I wanted to keep it super simple, something that can be very easily recreated! I was in need of a new notebook to pop into my bag so I can sketch on the go or jot down notes and inspiration wherever I go. As this was a notebook that was going to be living mostly in my bag I knew it needed to be simple in decoration as it was going to get some abuse! I’d been dying to try out the Wow bonding powder with the foil sheets so I decided this would be the perfect project for that! I took my notebook and the scribbled feathers stamp and stamped the feathers with my versamark ink pad. You can use any pigment based ink pad for this but as the versamark is designed for embossing powders I stuck with this. There are a few methods to using the powder and the foil but I went with the easiest one, melting the bonding powder and whilst it was still hot I rubbed the foil onto it. You need to press quite firmly and I just used the back of my nail to make sure I got all the little bits. I added another feather, the opposite way around, and went with a dark blue foil this time. The dark blue definitley shows up more that the pale blue and it did seem to transfer better. I still like the imperfect texture of the lighter blue though. I’m delighted with my little notebook! It’s the perfect mix of practical and decorative. The foil decoration isn’t going to come off or become damaged like a stuck on embellishment would and the foiling was a lot easier than I thought to do! I hope you enjoyed my tutorial and give making your own little notebook a go! Hello! It's Crew Member Wednesday again!! Today Karen is sharing a beautiful mixed media tag with beautiful colors and I love that sunny yellow and her home made washi tape using my "I heart washi" stamp set! Check out the video to see Karen's process! Hi everyone! It’s time for another Crew Member Wednesday and this project sees me creating on a jumbo sized tag just to shake things up a bit and get outside of my Art Journal. Working on a different size or substrate is like taking a walk to get some fresh air for my creativity! I made my own paper washi tape by using Birgit’s stamps and this time I tried stamping on top of some medial tape. The results were not quite what I was expecting but I loved the translucent effect anyway. I also got to play with the art masks and I was going to fussy cut the leaves when I remembered I had my scan and cut! I traced the design and cut out my own leaves to use in black card stock. I hope you enjoy watching my tutorial and you get inspired to try out a new size or item to get creative with! Hello! Welcome to Crew Member Wednesday. Today it's Karin's turn and she made 3 lovely cards using an Art Printing Plate and the Gelli Arts® gel printing plate. I think they are totally cool and yes, life is pretty awesome!! 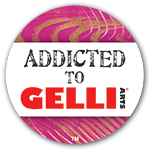 I used the Gelli Arts® gel printing plate and one of Birgit’s Art Printing Plate designs. I used different colors of paint on the gel plate. I drew a figure on a piece of paper and used it as a mask. I placed it on a phone book page, drew aroud it, cut it out and and glued it on the cards. I also made some marks on the cards with a white pen and some glitter markers. Hello! It's Crew member Wednesday!! In our family we celebrate a lot of birthdays in April/May, including my own ☺ so birthday cards?!? I love the fact that you can turn scraps into cards..! Hi, welcome to Crew Member Wednesday. Today it's Karin's turn and she made a really cool project! A birthday calendar! A few weeks ago I threw away my old birthday calender and therefore I decided to make a new one. I made a couple of gel prints and used a lot off different stamps and stencils on them. I cut them into the right sizes and colored some of the stamped images with acrylic paint markers. And at last I taped the already printed months on the gel prints and I clipped them on the clipboard and there it was…my new birthday calender!